This is a brush I already own and it has to be one of my most unique brushes with the foundation reservoir to the centre of it. This allows the foundation to apply evenly and blend a dream, it's also nicely dense but soft with it. This is a tad bit smaller than the bareMinerals one but I find this means I can use it both for foundation and concealing with. If you after a new type of foundation brush then for only £1.38 this is certainly worth it. Another brush I own here and one I really love! The functional ridge shape of the brush means this is great for getting into every curve of the face with powder or liquid foundation. I personally like to apply my foundation with one side of the wedge and then taking the other clean side blending it all in fully. Then using the very tip I blend around my month and eyebrow. This is such a great precision foundation brush and perfect to travel with as it has a shorter handle. Okay, so this brush has me intrigued. Of course the eBay dupe won't be as luxurious especially to the handle but with a saving of over £33 I just couldn't resist this! Also it's another unique brush to try out and see how I get on with. Once this arrives I may have to write a blog post on it I'm thinking! Another brush that's in my collection that again is just so unique and beautiful. Aside for the lovely wrapped handle and shape, the bristles to this are light weight and almost airy feeling making this a perfect brush to apply blush with, especially if you are heavy handed like myself. In fact I opt to use this over my Real Technique Blusher Brush! However something to note is that black dye does run from the brush when being washed but so far this hasn't caused the bristles fade and I think it may be the dye is from the inside of the wrapped handle. Lastly a lovely brush that's dense and short, perfect for both blush and contour. This is another incredibly soft brush and one I wouldn't guess was so cheap. I personally use this for contouring with and it works perfectly for me picking up the right amount of contour powder and really blending well. 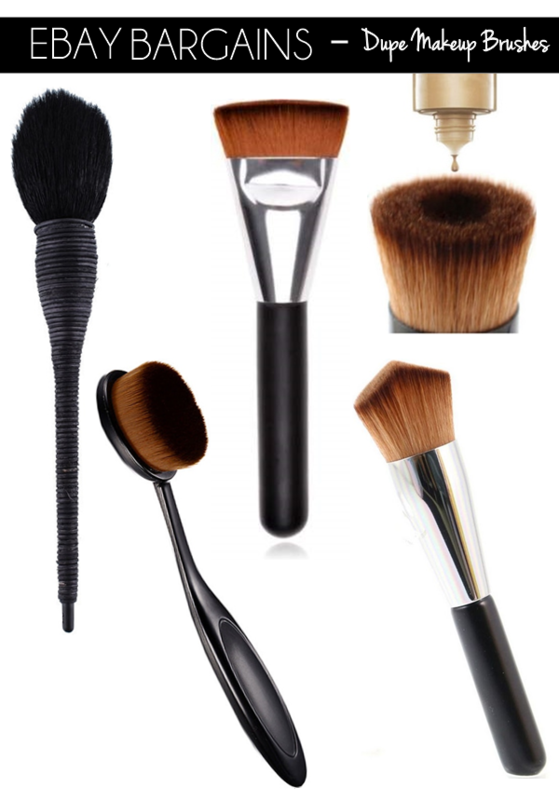 The total value if you were to buy the branded luxury versions of these brushes would be a huge £145 for 5 brushes. But if you went for the above dupes it would come to a teeny tiny £7.00?! Amazing!